Gobbolino has one white paw and blue eyes and isn't wicked at all, so his mother doesn't like him. He escapes to look for a kitchen home but is distrusted everywhere he goes and blamed for mysterious happenings. This is a tale of a witch's cat who would rather be a kitchen cat. 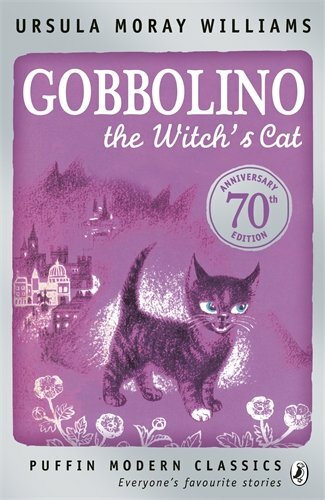 The charming tale of a witch's cat who would rather be a kitchen cat. Gobbolino has one white paw and blue eyes and isn't wicked at all, so his mother doesn't like him. He escapes to look for a kitchen home but is distrusted everywhere he goes and blamed for mysterious happenings, such as the farmer's milk turning sour and the orphanage children's gruel turning into chocolate.